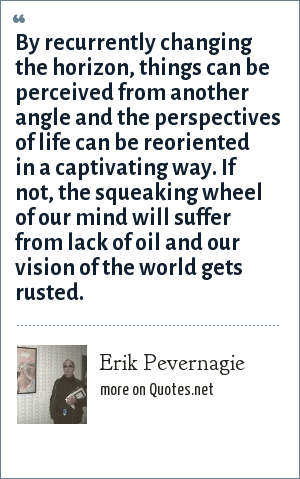 Erik Pevernagie: By recurrently changing the horizon, things can be perceived from another angle and the perspectives of life can be reoriented in a captivating way. If not, the squeaking wheel of our mind will suffer from lack of oil and our vision of the world gets rusted. "Erik Pevernagie Quotes." Quotes.net. STANDS4 LLC, 2019. Web. 18 Apr. 2019. <https://www.quotes.net/quote/63440>.